Republicans handed a major defeat to President Obama and Senate Democrats on Tuesday night when they seized control of the Senate by flipping at least seven seats from the Democratic to the GOP column. Republicans secured victory in seven states where Democrats currently hold seats -- Arkansas, Colorado, Iowa, Montana, North Carolina, South Dakota and West Virginia. Three incumbent Democratic senators lost their seats - Sens. Kay Hagan, D-N.C., Mark Pryor, D-Ark., and Mark Udall, D-Colo.
Iowa and West Virginia elected their first female senators -- Joni Ernst and Rep. Shelley Moore Capito, respectively. Republican Senate Minority Leader Mitch McConnell won re-election in Kentucky, putting him one step closer to becoming Senate Majority Leader next year. Current Senate Majority Leader Harry Reid congratulated McConnell on the Republican win. "I'd like to congratulate Senator McConnell, who will be the new Senate Majority Leader," Reid said. "The message from voters is clear: they want us to work together. I look forward to working with Senator McConnell to get things done for the middle class." Results are still out in Alaska, Virginia and Louisiana, a state heading into a Dec. 6 runoff between Democratic Sen. Mary Landrieu and Republican Rep. Bill Cassidy. Throughout the election cycle, Republicans tried to turn the campaign into a referendum on President Obama, tying their Democratic opponents to the unpopular president in campaign ads and stump speeches. Exit polls found nearly two thirds of voters nationwide said the country is heading down the wrong track with over half of voters disapproving of President Obama. Half of voters expect life for the next generation of Americans to be worse, the largest number to say so in exit polls since 1996. While a majority of voters expressed dissatisfaction or anger towards the Obama administration, as just as many said they were dissatisfied or angry with Republican leaders in Congress. 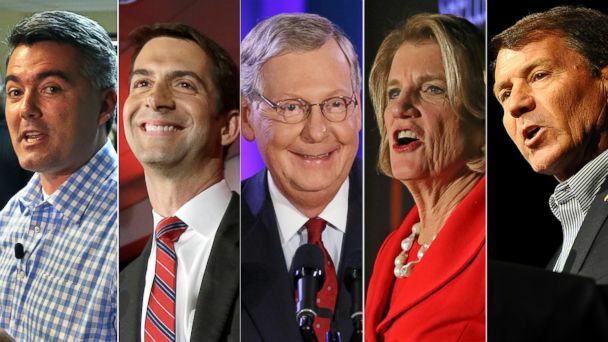 From the hog castrating, Harley-riding Joni Ernst in Iowa to the 37 year old former Army ranger Tom Cotton in Arkansas, here's a look at the candidates who won tonight's crucial Senate races, arranged by poll closing times. GEORGIA: DAVID PERDUE VS. MICHELLE NUNNRepublican David Perdue, a former CEO of Reebok and Dollar General, won the Georgia Senate race, clearing the 50 percent threshold needed to avoid a January run-off. He bested Democrat Michelle Nunn, daughter of well-revered former Sen. Sam Nunn, and Amanda Swafford, the Libertarian candidate, who polled in the single digits but could have acted as a spoiler in the race. Throughout the campaign, Perdue touted his business experience on the trail, but faced criticism after a leaked deposition showed he said he spent most of his career outsourcing jobs abroad. Perdue will replace outgoing Republican Sen. Saxby Chambliss. KENTUCKY: MITCH MCCONNELL VS. ALISON LUNDERGAN GRIMESRepublican Senator Mitch McConnell won re-election to his Kentucky Senate seat, putting him one step closer to becoming the next Senate Majority Leader when Republicans take control of the Senate. The 72-year-old current Senate Minority Leader beat Democrat Alison Lundergan Grimes, Kentucky's Secretary of State, in one of the country's most closely watched races. Democrats hoped to unseat McConnell, who has represented Kentucky in the Senate for thirty years, but Grimes lost steam in recent weeks when she refused to disclose whether she voted for President Obama. VIRGINIA: ED GILLESPIE VS. MARK WARNER The Senate race between Democratic Sen. Mark Warner and Republican Ed Gillespie in Virginia is looking much closer than expected. According to preliminary exit poll results, Warner's support among white voters has dropped markedly with the Virginia senator garnering the support of just over a third of white voters, compared to over 56% of the demographic in 2008. Additionally, Warner is leading Gillespie in support from independents by just single digits, a group he won by 38 points in 2008. Gillespie is also running close with Warner in the Richmond/East region, an area which accounts for a quarter of Virginia's voters. A former Virginia governor, Warner was among the Democrats first elected to the Senate when Barack Obama won the presidency in 2008. Gillespie, who is running for elected office for the first time, formerly worked in the George W. Bush administration and previously served as chairman of the Republican National Committee. NORTH CAROLINA: KAY HAGAN VS. THOM TILLIS North Carolina state House Speaker Thom Tillis defeated Democratic Sen. Kay Hagan in a race Democrats hoped would be a bright spot on Election Night. Hagan's seat was the seventh to flip to Republican control this cycle, padding the GOP's new majority. Hagan, who entered office with the help of President Obama's coalition of support in 2008, did not receive the margins of support she needed from urban voters in Charlotte and Greensboro to counter Republican turnout in rural parts of the state. Both candidates ran intensely negative campaigns. Tillis, like Republicans across the map, depicted Hagan as a rubber stamp for President Obama and criticized her for missed Congressional hearings and personally benefitting from federal stimulus money through a company owned by her husband. Democrats localized the race, accusing Tillis of leading a conservative state legislature responsible for cutting public education funding and denying equal pay to women. NEW HAMPSHIRE: JEANNE SHAHEEN VS. SCOTT BROWNJeanne Shaheen won re-election in New Hampshire against Republican candidate Scott Brown. Brown, a former Massachusetts senator, shocked the political world in 2010 by winning the seat long held by the late Ted Kennedy. He was defeated in 2012 by Sen. Elizabeth Warren. He would have been the third senator in American history to represent two states. Brown jumped into the race against Shaheen, a former governor and state senator, in April. He's faced down accusations of being a "carpetbagger," and tied Shaheen to President Obama's agenda and leadership on the U.S. response to the spread of the Ebola virus and terrorist group ISIS. Shaheen has portrayed herself as an advocate for New Hampshire rather than her party, and focused her campaign on women's health and equal pay. Over the weekend, former Secretary of State Hillary Clinton made her last campaign stop of the 2014 cycle in New Hampshire to stump alongside Shaheen. ARKANSAS: MARK PRYOR VS. TOM COTTONIn a stunning blow to Democrats, Rep. Tom Cotton, R-Ark., beat two-term Democratic Sen. Mark Pryor, the first Senate Democrat to lose his seat this election cycle. Pryor's loss is a major upset to Democrats who were hoping to hold onto the seat and keep Republicans from taking control of the Senate. Pryor comes from a popular political family in the state. His father, David Pryor, represented Arkansas in the U.S. Senate and served as the state's governor. The family maintains close ties with the Clintons, a connection that prompted former President Bill Clinton to campaign on Pryor's behalf on multiple occasions. But Cotton, a one term congressman and former Army Ranger who served in Iraq and Afghanistan, was able to break through Pryor's deep political connections in the state. Throughout the campaign, Cotton, 37, repeatedly tied Pryor to President Obama, whose favorability has reached an all-time low, and stressed issues related to national security, including how the administration's is dealing with ISIS, on the campaign trail. COLORADO: MARK UDALL VS. CORY GARDNERRep. Cory Gardner, a rising Republican star, defeated Democratic Sen. Mark Udall in Colorado, where universal mail-in ballots and a large bloc of Hispanic voters added uncertainty to one of the tightest Senate races in the country. Udall was one of the three Democratic incumbents to lose their Senate seat. Udall, the son of the late Arizona congressman Mo Udall, lost control of the race this fall amidst criticism that his campaign focused too closely on Gardner's past positions on women's health. In March, Gardner said he no longer supported personhood amendments, which doctors say would limit access to birth control and make abortions illegal. He later voiced support for over-the-counter birth control. Nearly half of all ads in the race mentioned abortion, according to CMAG/Kantar Media, which tracks television ad spending. Though more Republicans returned ballots than Democrats in the final days of the race, Democrats-whose get-out-the-vote operation in 2010 powered Sen. Michael Bennet to a narrow victory and served as the blueprint for their national operation this year-were optimistic they could make up the difference. LOUISIANA: BILL CASSIDY VS. MARY LANDRIEU VS. ROB MANESSThe Louisiana Senate race is heading into a December 6th run-off as no candidate was able to secure 50 percent of the votes Tuesday. ABC News projected Sen. Mary Landrieu, D-La., will face-off against Rep Bill Cassidy, R-La., in the December run-off that is shaping up to be a Bayou brawl. Campaign committees and outside groups have already reserved airtime ahead of an expected run-off. The National Republican Senatorial Committee has set aside $3.3 million to run ads in the month ahead of the December run-off. The Koch-backed group Freedom Partners has also reserved $2.1 million in television advertisement time ahead of an anticipated run-off in the Bayou State. KANSAS: PAT ROBERTS VS. GREG ORMANSen. Pat Roberts, R-Kansas., managed to hold onto his Kansas Senate race despite a strong last minute push from independent Greg Orman. Republicans needed to hold onto the seat in order to gain control of the Senate. The fate of Roberts' Senate seat came into question when Democrat Chad Taylor dropped out of the Senate race in September, paving the way for Orman to jump in the polls. Roberts, who has represented Kansas in Washington, D.C. since 1981, faced setbacks in the campaign over questions about his residency as well as concern from conservative voters about his track record in Washington, D.C. Orman, a little known businessman, had declined to say which party he would caucus with should he win the Senate seat, but Republicans suspected he would align himself with Senate Democrats. SOUTH DAKOTA: LARRY PRESSLER VS. RICK WEILAND VS. MIKE ROUNDSAn entertaining three-way contest for South Dakota's open Senate seat ended with a Republican pick-up. Republican Mike Rounds, a former governor, defeated independent candidate Larry Pressler, a former Republican senator who voted for President Obama in 2008, and Democrat Rick Weiland. While the race for retiring Democratic Sen. Tim Johnson's seat was a likely Republican pickup, both parties' campaign committees announced six-figure ad buys in September after polling showed a tighter race between the three candidates-buys that were later scaled back after further polling showed Rounds with the lead. The race was one of the most colorful: Pressler, who once considered running for mayor of Washington, D.C., has read poetry on the campaign trail, while Weiland has released a number of country-song covers as political ads. IOWA: JONI ERNST VS. BRUCE BRALEYRepublican Joni Ernst defeated Rep. Bruce Braley in the Iowa Senate race to fill the open seat vacated by the retirement of Sen. Tom Harkin, a Democratic stalwart in the state. Ernst, 44, will be the first female senator to ever represent Iowa, a state that catapulted Barack Obama's career just six years ago. Ernst, an Iraq war veteran, shocked the political establishment when she won a crowded GOP primary in June. Ernst, a little known state senator, burst onto the national scene after releasing an attention grabbing ad called "Squeal," which featured her talking about castrating hogs. Braley stumbled throughout his campaign - from making remarks that insulted some Iowa farmers to threatening a lawsuit against his neighbor over roaming chickens. Republican and Democratic surrogates with potential 2016 ambitions flooded Iowa in the final weeks of the campaign to help their candidates. ALASKA: MARK BEGICH VS. DAN SULLIVANFirst elected to the Senate the same year as Barack Obama won the presidency, Democratic Sen. Mark Begich is fighting to secure a second term in the U.S. Senate. He's opposed by Republican Dan Sullivan, the state's former attorney general and a lieutenant colonel in the U.S. Marine Corps. Democrats are banking on their strong ground game in distant areas to help Begich keep his seat, but Republicans hope Sullivan's efforts to link Begich to Obama will help him win another seat for the GOP. Over the weekend, Sen. Ted Cruz and former GOP presidential nominee Mitt Romney swooped into the state to help Sullivan shore up support among the conservative base. With polls closing at 1:00 a.m. ET and the need to count ballots from far-flung communities, results for the Alaska Senate race - and potentially control of the Senate -- may not be known for days. There is little airworthy polling in the state, but an early October CNN poll found Sullivan leading Begich 50 to 44 percent.